I was told that I cannot have dental implants because there is not enough bone. Can they still be done? How long should I wait after removing a tooth to have a dental implant placed? How long have dental implants been around? Why are there two dentists involved with dental implant treatment? What is the maximum age that someone can have dental implants before they are too old? Can someone be too young to have dental implants placed? I have periodontal disease. Will I have periodontal disease when I have implants placed? I am a smoker and I was told I have to stop smoking to have dental implants placed. Is this true? Is there a difference between teeth and implants in terms of home care? My dentist does not do dental implants and said that I should do a bridge to replace a tooth. Why is a bridge better? How do dental implants keep the bone from shrinking? How long does it take to place an implant in the bone? How long is the dental implant treatment? Most people can have dental implant treatment. The limiting factor is mostly the medical condition of the patient. If the patient is too frail to handle minor oral surgery then this elective treatment may be contraindicated due to possible medical and surgical complications. There are many procedures that can improve bone quality and bone quantity. In most cases dental implants can be done even in severe bone loss cases. See the section on bone grafting for more information. There was a time when the standard was to wait 6 months after extraction before a dental implant could be placed in an area where a tooth was removed. This is now not the case. The waiting time is really patient specific, and even tooth are specific in a patient. This means that there are many different time segments to consider. Implants can sometimes even be placed at the same time as the extraction (see section on immediate implant placement). In cases that require grafting, this waiting time can be anywhere from 4 months to over a year. If a tooth is removed and there is an infection this will also complicate the situation. So the short answer is anywhere from no waiting time to a year. Dental implants have been used to replace teeth since 1984 in North America. (Root form Implants). They have been used in Europe for a lot longer. They were accidently discovered by Dr. Brandemark who noticed that the screws that held bone plates in fracture repairs created a bond with the bone. He then extrapolated this to use Titanium screws to replace tooth roots. Usually a dentist who has extensive surgical experience, or is a surgical specialist such as a Periodontist or Oral Surgeon will perform the surgical part of the treatment, and a general dentist that has experience with restoring implants does the prosthetic part of the treatment (providing the teeth). There are dentists that have experience in both surgical and prosthetic dental implant treatment, and may perform both the surgical and prosthetic parts of the treatment. There is no maximum age, it all depends on the health of the patient. 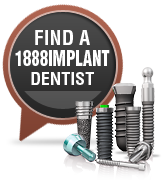 There are many patient in their 90's that are having dental implants placed. Yes, patients that are less than 18 years of age or are still growing should wait till they stop growing before dental implants are placed in their mouth. The reason is that if there is some jaw growth the position of the implant may be distorted and may cause complications. This is not to say that one MUST be over 18 years old. If the patient has stopped growing or it is determined that there will be no jaw growth complications then implants can be placed for an individual less than 18 years of age. Periodontal disease by definition is a disease of the periodontal ligament that is around natural teeth. Dental Implants do not have a periodontal ligament therefore they cannot get Periodontal disease. This does not mean that an individual does not have to keep up with proper oral hygiene (home cleaning care) because dental implants can get something called Peri-implantitis. This is inflammation of the soft tissues (gums) around the dental implants. Dental implants can last many years but like everything nothing is guaranteed for life. The average dental implant will have a 21 year life span. Again there are many factors that influence how long they will last. Some of which are smoking, diabetes, oral home care etc. Smoking is not good for dental implants as it is not good for anything else in the body. There are definitely higher incidences of failure and complications with dental implants when the patient is a smoker. Now, this does not mean that dental implants cannot be placed, but it may mean that the treatment may take longer. There may be more complications, and the implants will not last as long as if the patient was not a smoker. So with this information the patient needs to decide to put up with the complications of quit smoking. The amount of smoking obviously is also a factor. A standard single dental implant to replace tooth is quite painless. Actually taking out a tooth would cause more pain than placing a dental implant. The more implants placed and additional treatment such as grafting can make the treatment more uncomfortable. The procedure is done usually under local anesthetic so it is just the needle that the patient feels. Afterwards the discomfort is minimal. With more complex situations the patient may be put "under" general anesthetic. Definitely. Dental implants look like teeth but they are not teeth.They have a different anatomy; we cannot treat them like teeth with home care. Please see the section on dental implant care for more information. Generally a dental implant is a better choice of treatment over a bridge. Although there are circumstances where a bridge may be the choice the dentist and patient go with, every case is different, and you need to educate yourself on the options so you can make an informed decision with your dentist. This question is very hard to answer. It depends on whether there is grafting involved, whether each replaced tooth will have an implant supporting it (implant bridges) or whether implants are there to support a denture. The best way to get an idea of cost is to get an estimate for your particular situation (see free estimate). The majority of a dental implant is made from Titanium as well as other metals to increase the strength. With every bite the teeth stimulate the bone as do dental implants. This prevents the bone from shrinking. Where there are no teeth there is no stimulation, so the bone atrophies (shrinks). The human body works on the principle if you don't use it you lose it. If you do not exercise a muscle it will shrink. That is why astronauts cannot stay in space stations too long. There is no gravity in space so they are not using their muscles and they become very weak. It varies, but an experienced implant dentist should be able to place in implant in less than 30 minutes. Again, that time depends on possible complications and access in the mouth. The treatment can vary, but with no complications, and no grafting, can take about 6 months starting to finish. There are situations where the implants can be done in one day (implants in a day), and there are other situations where it might take much longer than the average 6 months. Your best bet is to get a professional opinion that is specific to your situation.